Just a spoonful of dance music makes the adrenaline go up…in a most delightful way! 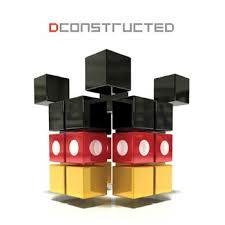 Disney has just released, “DCONSTRUCTED”, a remix album of some of the most beloved movie music of yesterday and today. The songs have been re-worked and given an edge that we would not normally expect from the family-friendly company. These are definitely not the type of tunes that you hear on Radio Disney or the Disney Channel. “DCONSTRUCTED”, is working out at the gym….blasting your car stereo…or going for a long run type of music. It is a big welcome surprise all rolled into 14 entertaining tracks. Some of the top electronica and house mix-masters in the business including Avicii, Kaskade and Armin Van Buuren were added to the album and brought new life to the music. While some of the songs on the album are good old fashioned remixes; a few are industrial trance tracks and violent dubstep remixes that could easily be played in a trendy New York nightclub. “The Muppet Show” theme song and “Fall” from Tron Legacy are two of my favorites from this album because of their edgy take on the iconic music. “The Main Street Electrical Parade” song from the parks also makes an appearance and does not disappoint. 1. “Circle of Life” (Mat Zo Remix) – Carmen Twillie & Lebo M.
It is one of those albums that you can listen to from the first track to the last and for $10.00…even Scrooge McDuck would approve this purchase! You can purchase, “DCONSTRUCTED” through iTunes or Amazon. Keep calm and dance on!